On 25th July each year, on the occasion of St James Day, the patron of Opatija, the City celebrates by awarding its personalities of the year the St James Medal. 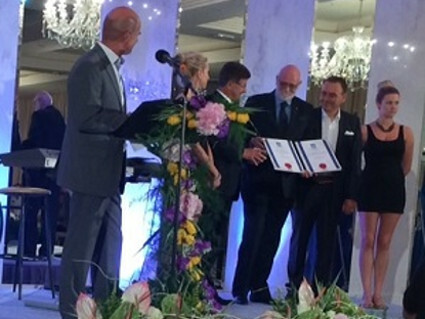 The official public ceremony was held this year at the Royal Hotel and chaired by the Opatija Mayor Ivo Dujmic, in the presence of the City and Regional Authorities, during which our World Bridge Family was honoured with two prestigious awards. The Opatija City Council bestowed Honorary Citizenship on the World Bridge Federation President Gianarrigo Rona, awarding him the St James Medal, which was also awarded to the Opatija Bridge Association and its President Goran Grguric.